Hillary Clinton is preparing for the presidential debates in a unique way. No, she is preparing to attack Trump’s personality. These debates are about to become a battle of egos at the psychological warfare level. That much is no surprise, but she is taking things pretty far. 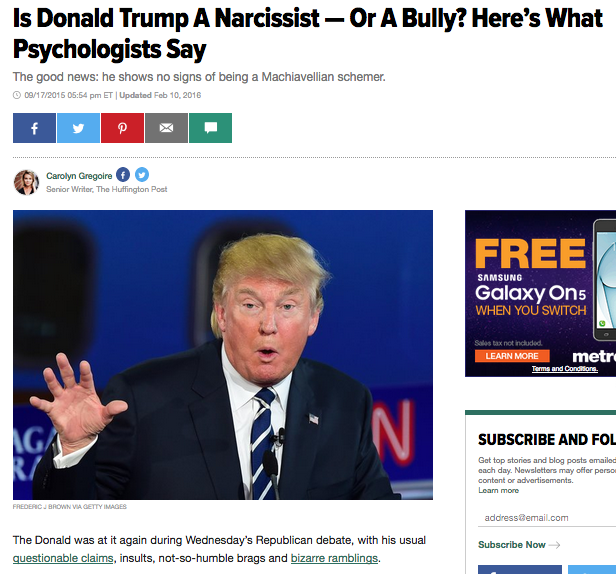 Advisors have been feeding Hillary experts in psychology hired to assess Donald Trump’s personality, pick out his inner fears and weak points, and brain storm about the possibilities of exploiting any mistakes he might make. The New York Times reported in August that Hillary Clinton’s campaign brought in psychology experts to help her prepare to debate Donald Trump. Which is weird, because that’s not really what psychologists do. Hillary Clinton’s advisers are … seeking insights about Mr. Trump’s deepest insecurities as they devise strategies to needle and undermine him … at the first presidential debate … Her team is also getting advice from psychology experts to help create a personality profile of Mr. Trump to gauge how he may respond to attacks and deal with a woman as his sole adversary on the debate stage. They are undertaking a forensic-style analysis of Mr. Trump’s performances in the Republican primary debates, cataloging strengths and weaknesses as well as trigger points that caused him to lash out in less-than-presidential ways. But at the same time, the people quoted in the article are acting as if psychology can offer up no tangible results, as it is perhaps to vague or generalized to be used practically. Psychology has long been interested in the nature and structure of personality. But as for studies of “trigger points,” strategies for needling and undermining people, or systems for predicting how a man with a misogynist past might betray his true feelings in the future — there isn’t much to be found. But in reality, this has been standard operating procedure for clandestine intelligence for some time. And it has already been operational in Hillary’s campaign. Whereas her psychologists are seeking advice on her chances for using the ‘woman card,’ fresh Hillary ads are playing upon quotes from Trump’s own past deriding women – while showing the faces of young women today. During World War II, Allen Dulles was the nation’s number two spymaster in the OSS, and was stationed in Bern, Switzerland, where he kept very close company with Carl Jung, who was also tapped as an OSS Agent. Dulles got even closer to Jung’s assistant Mary Bancroft, whom he was having an affair with, but that’s another matter. Jung, as the leading figure in analytical psychology, was conducting studies on the personalities of Hitler, Mussolini, as well as top leaders throughout their ranks, probing for psychological hang-ups that might play out and yield weakness or defects. Carl Jung is credited with predicting that Hitler would commit suicide, supposedly based on his introverted tendencies and extreme paranoia. For Allen Dulles, the use of Jung’s insights, and the ability to tap into a network of trained psychologists around the world, also signaled the rise of psychological warfare as a serious black art. Other leading figures in U.S. and European psychology were conducting similar efforts at profiling Hitler and many other noteworthy figure. By the time that MK Ultra began in 1953, coinciding with Allen Dulles taking the helm of the CIA he helped create, clandestine uses of personality tests, psychological profiling and other forms of assessment were in full use. With one exception, the CIA’s behavioral research—whether on LSD or on electroshock—seems to have had more impact on the outside world than on Agency operations. That exception grew out of the work of the MKULTRA program’s resident genius, psychologist John Gittinger. While on the CIA payroll, toiling to find ways to manipulate people, Gittinger created a unique system for assessing personality and predicting future behavior. He called his method—appropriately—the Personality Assessment System (PAS). Top Agency officials have been so impressed that they have given the Gittinger system a place in most agent-connected activities. To be sure, most CIA operators would not go nearly so far as a former Gittinger aide who says, “The PAS was the key to the whole clandestine business.” Still, after most of the touted mind controllers had given up or been sent back home, it was Gittinger, the staff psychologist, who sold his PAS system to cynical, anti-gimmick case officers in the Agency’s Clandestine Services. And during the Cuban missile crisis, it was Gittinger who was summoned to the White House to give his advice on how Khrushchev would react to American pressure. You can bet that the CIA and related agencies have come a long way since this point in the 60s, when things were already getting very out of hand. Sizing up weakness in enemies is an age old tactic. But the CIA make it a science in the 1950s – an Hillary is using the fruits of those experiments today. Hillary Clinton’s use of psychologist in effort to win the war against Trump is drawing from this dark strain of psychology, not from the naive everyday psychoanalyst who tells you to lie down on the couch and talk about your past, but from a fairly sophisticated approach to breaking down the underpinnings of a fragile leader desperate to conquer and achieve legitimacy (and afraid to fail and lose acceptance of the father figure). Or, something like that. Once again, Hillary is working on the dark side, and they are laying out all the traps they can for Trump. Given her growing unpopularity, and the recent faux pas of her campaign in denying and cover-up Hillary’s health issues, email scandals and a host of other dirty laundry, she’ll need every trick in the book to turn around public opinion. Records have revealed that there were at least 638 plots, mainly hatched out of the CIA, that attempted to oust or kill Fidel Castro covertly… and yet Castro has lived out his life in power. As conventional options failed, the plots got wackier and wackier… and U.S. intelligence efforts ended in frustration. In the end, the CIA determined that it couldn’t successfully take out Castro unless it could undermine his support from the public first. Just killing him would be the easy part; but becoming a martyr too easily takes on momentum, and making it work against his cult of personality proved a different and much more difficult beast to tackle. Today, Hillary’s public perception problem is her own worst problem. The scandals are piled up. Her team can take down any leader in the world, perhaps, but can they sell a naked emperor to a public that is just plain sick and tired of corruption, lies and war mongering while everyone else gets shafted economically? History suggests that the shadow operative can pull off a lot of dirty tricks, but practically no one can turn against the tide. The war is fought in the shadows, but is won in the forum of public opinion. Previous Did You Know that Over 7700 Terrorists Were Encountered Trying to Enter the Country?